The Multi Spred 300 salt spreader is a simple tow behind salt spreader. 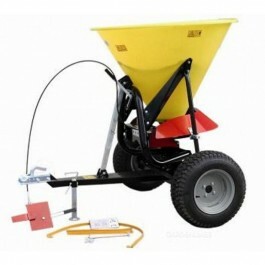 Ideal for spreading salt and coarse materials during the winter periods. The spreader is ideal for de-icing or anti-icing in shopping precincts, factories, hospitals, car parks, outdoor dispatch areas, ports, etc. The spreader features a large 250kg hopper capacity, free run setting, anti-spread safety screen, tow agitators and a salt deflector kit. Mounted to a Magnum trailer which features a standard lockable tow hitch, suspension and an can be fitted with an optional road kit which includes a lighting bar. Ideal for multi site use, commercial use, and gritting large areas. Ground clearance of 250mm and weighs 45kg.